In a nod towards the history of Miraval Resort & Spa’s location in the southwest, this stewy soup recipe celebrates the green chile, a fiery green pepper native to New Mexico and definitive of New Mexican cuisine. Heat a large saucepan over high heat. Add 1 tbsp of the oil and swirl to coat the bottom of pan. Lower the heat to medium-high, add the onions, and cook, stirring for 1 minute. 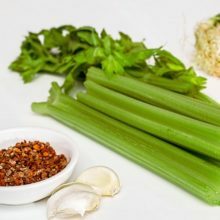 Add the celery, stir, and cook for 45 seconds. Add the garlic and cook, stirring for 45 seconds. Add the pepper and cook, stirring for 1 minute. Add the remaining 1 Tbsp. of oil and stir well. Add the pork and cook, stirring to sear on all sides, about 3 minutes. Add the tomatillo, hominy, 2 Tbsp. of the cilantro, the chili powder, cumin, salt, and pepper; stir well and cook for 1 minute. Add the stock, stirring to scrape any bits from the bottom of the pan. Increase the heat and bring to a high simmer. Reduce the heat to medium-low and simmer until the meat is tender and cooked through, 40 minutes. Remove from the heat and stir in the remaining 2 Tbsp. cilantro. Divide the stew among 12 serving bowls (half cup per serving). Garnish each portion with 1 tsp. cabbage, ¼ tsp. of the cheese, and 1/8 tsp. of the lime zest; and serve immediately. This is a kitchen staple that’s used in many of the recipes in this book. By combining the two oils, the higher heat-resistant properties of the canola oil help to preserve the flavor of the more delicate extra-virgin olive oil. Combine in a spray bottle or mister and sue to sauté food.